US media commentary has been prolific for some time regarding Denver Bronco quarterback Tim Tebow and now is nudging its way into Australian newspaper columns. Fairfax papers’ such as The Age in Melbourne today reported how ‘America fawns over God’s anointed NFL star’ but even well-known Australian religious cynicism put barely a dent in the 24-year-old Christian grid-iron player’s almost miraculous aura. “Even Americans who have never tuned in for a Sunday afternoon game have come to admire Tebow’s humble demeanour and his religious devotion, which they say makes him an ideal role model for youngsters. Some have been disarmed by his matinee idol looks and ripped physique. Others see him as a potent anti-abortion symbol, after hearing the now familiar story of how his mother had refused, against her doctors’ advice, to terminate her pregnancy while carrying “Timmy.” She now is one of America’s most vocal pro-life advocates. And then there is Tebow’s typical after-touchdown celebration which sees him drop to one knee, eyes closed and head bowed in prayerful thanks. The pose has been dubbed ‘tebowing’ and while hearing American stars give thanks to God is commonplace (even those whose lifestyles belies any hint of an interest in God) Tebow’s is undoubtedly sincere and is catching on fast. In Australia we’ve had rugby league stars such as Jason Stevens, Jarryd Hayne and Tim Manna all being reasonably forthright about their faith but without the constant adoration (or aversion) attaching to Tebow. 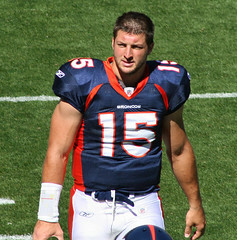 Even players on opposing teams seem awestruck, convinced that God is working mightily in Tebow. “I think us losing to Tim Tebow the way we did, we’ve seen it first hand,” said Miami Dolphins linebacker Karlos Dansby, after his team was spanked by the Tebow-led Broncos earlier this month. “The young man is blessed. The young man has a special anointing on him,” Dansby said in a published interview, conceding that there was no defeating God’s chosen quarterback that day. Those outside of faith traditions might not understand the full connotation of the reference to anointing. In the Old Testament, kings and priests and sacred objects were anointed with special oils (some mixtures decreed by God himself) for the setting apart of the person or thing for God’s special use. In the New Testament the meaning shifted to a spiritual ‘anointing’ in which the believer is endowed with a special enabling of the ‘oil’ of the Holy Spirit for the work of God. It is not something that is earned, in Scriptural terms, but the enabling presence of the Spirit that overflows from a gracious relationship with God. Let’s not wait for a moment of glory on the sporting field to ‘tebow’ – any time or place is good enough. Posted in Australia, FindingFaith, News, Religion, Sport.Tagged Denver Bronco, God, Holy Spirit, Jarred Hanes, Jason Stevens, Tebow, Tim Tebow.